Bugle calls are short traditional pieces of music played on a bugle, a musical instrument which for centuries has been used by the armed forces of many countries as a means of communication. The bugle can be heard over long distances, and the sound can be heard in a noisy environment (such as during a battle), so it is a highly effective way to communicate simple information and orders to a large number of people. Although such a method of communication is perhaps no longer required by today's armies, bugle calls are still used by many forces, though in many cases it has become part of traditional rituals with a particular role during ceremonial occasions. If bugle calls are played by a modern instrument with valves (such as a trumpet), then the valves can be kept in any fixed position to establish a fundamental note and its related harmonic series. Although the convention is that sheet music for bugle calls is notated in the key of "C", the music can be played in whatever key is convenient for a given instrument. Most of the example bugle calls listed below have been created as though played on an instrument in "G" so they play a fourth lower than notated. The exceptions are the "Deguello" (due to its lower range) and the extract from the "Leonore Overture" both of which use a Trumpet in B-flat. Trumpet or Horn-like instruments have been used for millenia, with early references in the old testament e.g. Joshua's Army marching towards the Walls of Jericho blowing their Trumpets. There is also evidence that similar instruments such as the "buccina" were used by Roman Legions. More modern historical usage is documented by the cavalry, infantry and navy of several European countries, and standardisation took place across the regiments of the British Army during the 17th century. It seems likely that many bugle calls have evolved over time though some longer more complex calls (such as the Last Post) may have been composed, with some sources suggesting that Joseph Haydn may have composed some calls. The French, British and Prussian forces at the Battle of Waterloo all used musicians among their armies including buglers, and a battered bugle was recovered after the battle and later used as part of the 200th anniversary memorial events in June 2015. American forces adopted and further developed a number of bugle calls from the British and French equivalents, and there are variations among the military forces across the globe. There are some similarities in the history of Bugles and Horns. Horns were originally animal horns and traditionally were used during hunting activities. In both cases, early instruments had no valves and so played notes within the given harmonic series. 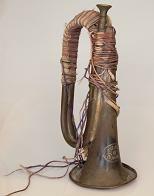 The main difference is that horns retained their curved shape even when constructed from brass, sometimes lightly curved and at other times the tubing is fully curved to make one or more circles, with the bell pointing away from the player at an angle. Both instruments served a similar purpose of communicating over distances, and in both hunting and military contexts a variety of calls were used to communicate different signals. It is worth noting that there are other musical instruments with a significant military history. In addition to the bugle, there is the shrill sound of the Fife (similar to a piccolo), and the penetrating sound of the Bagpipes (used by the regiments of Scotland and other countries). Many other wind instruments have been used in a military context because they can be carried easily. The drum has also served an important military purpose for many centuries (or more accurately millenia). Its regular beats can be used to accompany marching and other ordered regular activities, and indeed the speed of an advance can be indicated by the frequency of drum beats. 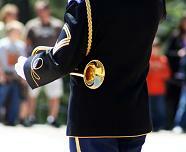 Bugle calls are signals or commands to troops denoting a range of scheduled and unscheduled events. In camp, bugle calls mark key events during the day - with some of the most important being events such as wake up, assemble, dismiss, meal times or lights out. In battle, bugle calls signal instructions to be carried out, with key commands being things like charge, recall, advance, etc. Bugle calls need to be suitable for their intended purpose. Urgent calls need to be short and easily recognised in order to get an immediate response. Some of these calls may be repeated a few times to ensure that everyone has got the message. However other activities such as those of a ceremonial nature can afford to have longer bugle calls. There are many different bugle calls used or formerly used by many different forces across the world. What we have included on mfiles is a selection of bugle calls which the average civilian may have heard before or can readily relate to. In all cases the following links will take you to the sheet music page for the bugle call, and from there you can download pdf, midi and mp3 versions as you prefer. Charlie Reveille - Reveille is the French word for "wake up"
Long Reveille - a longer signal to "wake up"
Reveille (US) - "You gotta get up, you gotta get up, you gotta get up this morning." Rouse - also meaning "get up"
Meal Time - "Come to the cook house door, boys, come to the cook house door." Taps - an alternative end of day call derived from a French call marking "lights out"
Bugle Calls have had a subtle but significant influence on music and popular culture in general. As an example of their influence on classical music, see the last two bugle calls in the above list. Tchaikovsky was on holiday in Rome during the winter of 1879-80 where he composed his work called "Capriccio Italien" which incorporates folk songs and other sounds the composer heard while in Rome. There was a cavalry barracks next door to his hotel and he transcribed a bugle call which he heard every morning coming from the barracks. This bugle call is used as the opening bars of Capriccio Italien and here transcribed into standard bugle notation. One of the earlier versions of an Overture for Beethoven's Opera Fidelio is his Leonore Overture No.3 composed in 1806. In the middle of this is a trumpet call which is very much like a bugle call, only the notes are not quite from a single harmonic series as would normally be played on a Bugle. Here is the Trumpet Call and as directed by the composer, it is usually played by a Trumpet off-stage so that it sounds distant. Haydn's Symphony No.100 is called the "Military" because of the military symbolism and instrumentation in the 2nd movement. This features a group of percussion instruments (bass drum, triangle and cymbals in addition to timpani) which was unusual at the time, and a bugle-like trumpet call. Vaughan Williams has also been inspired by Bugle music. He served as an Ambulance orderly in France during WWI and his experiences of war influenced many of his works. He recalled hearing a bugler practising his instrument, and this is remembered in the 2nd movement of the composer's 3rd (or "Pastoral") Symphony when he has a trumpet playing a melancholy solo. Similarly there are Trumpet calls similar to Bugle calls in other classical works such as the 1st movement of Gustav Mahler's 3rd Symphony and some works by Shostakovich. In a number of armies, words have been added (mostly informally) by soldiers, to help them remember the meaning of the calls. These phrases have from time to time appeared in popular songs. A good example of this is "Come to the cook house door, boys, come to the cook house door." which signifies Meal Time in UK armies. The words "Come to the cook house door boys" and a mention of "reveille" were included in the war-time song "Oh, it's a Lovely War" in 1917. The U.S version of the Reveille call is associated with the words "You gotta get up, you gotta get up, you gotta get up this morning.". Similarly Irving Berlin incorporated the words "You gotta get up this morning." in his 1918 song "Oh how I hate to get up in the morning" which the song-writer later used in his musical "This is the Army". This initially appeared on Broadway during World War II and was then made into a morale-boosting film. Oh, How I Hate to get up in the Morning sung by Irving Berlin in the 1943 film of his musical "This is the Army". In some of the most powerful scenes in "The Good, The Bad and The Ugly" the composer Ennio Morricone uses musical phrases similar to bugle calls against a slow melody in the track The Strong (Il Forte) which reinforces the story's setting during the American Civil War when the characters encounter the military of both sides. In the film "Patton" the composer Jerry Goldsmith uses simple two-note figures to introduce the Main Theme. Their bugle-like quality, when coupled with snare drums, piccolos and a march theme, all serve to underline the military background of the famous General. In the film "Apollo 13" the composer James Horner uses a main theme first played on trumpet which strongly suggests a bugle call, the "Last Post" in particular. In this case the composer is not directly suggesting the military, but evoking heroism and national pride in the Apollo endeavour in general and the return of Apollo 13 in particular. On youtube you can listen here to the Apollo 13 Main Theme. The classical composer Dmitri Shostakovich also composed many film scores for the Russian cinema. His music for the 1936 film "Podrugi" ("The Girlfriends" though also known as "Three Women") includes this fanfare figure for solo trumpet in the form of a bugle call - a reminder of wartime events. In the US bugle calls or similar have been used at sporting events, with First Call being widely used at horse races for example. Bugle calls are also sometimes used as fanfares when military personnel are providing public entertainment, such as at parades, displays and shows. In the UK one of the biggest shows of this kind is the Edinburgh Military Tattoo held at Edinburgh Castle. Some non-military groups have based elements of their discipline on the military, and have adopted bugle calls as part of this, with the U.S. Scouting movement being the obvious example. 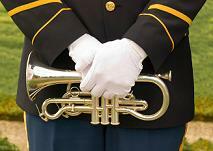 Two of the most widely recognised bugle calls are The Last Post and Taps. Originally used to signify the end of the day, their association with "the end" of something has resulted in their use at military funerals. This symbolic use has spread to related occasions such as remembrance events and other ceremonies to honour those who have died in battle. The music itself and the strength of this association, means that listening to "Taps" and "The Last Post" can be a very emotional experience for the listener. There is more about Funeral Music and Remembrance Day Music in these mfiles articles which both include many examples. In the book "Time Enough for Love" the Science Fiction novelist Robert Heinlein illustrated some of the book's chapters with certain bugle calls. The particular bugle calls quoted related to key events taking place in those particular chapters of the story. We have commented on the cultural associations of bugle calls, but is there a deeper meaning? In our article What is Music? we mention the distinction in Western music between major and minor chords, observing that the notes of a major chord arise from earlier members of the harmonic series. To ears conditioned by years of listening to Western music, major chords sound more harmonious and are more often used in music depicting pleasant or good emotions. 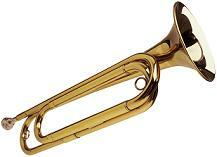 The notes played by a bugle are the same as the notes of a major chord - in the key of "C" these notes are C, G and E. There is something very elemental and strong about these notes and from time to time composers have used basic melodies which tap into the power of these notes. In Also Sprach Zarathustra (the 2001 theme) the composer Richard Strauss uses a musical motive consisting of 3 ascending notes which are C-G-C first heard on trumpets. This music was inspired by Nietzsche's book of the same name which talked in metaphysical terms about Übermensch (often translated as "Superman"). Interestingly John Williams starts his theme for the movie "Superman" with an opening fanfare whose first 13 notes on the trumpet consist entirely of the notes C and G. Both of these motives have an elemental strength which springs from their simplicity and position in the harmonic series. One final example also concerns the composer John Williams. For the movie "Close Encounters of the Third Kind" Steven Spielberg wanted one of the methods of communication used by the aliens to be through the use of music. The filmmakers tried hundreds of combinations of notes before finally agreeing on a sequence of 5 notes, which they felt formed the simplest yet most complete and satisfying musical phrase suitable for the purpose of alien communication. In the key of C these notes are D-E-C-C-G so 4 out of the 5 notes come from a simple major chord. My father served in the British Army for his National Service in the late 1940s. He used to play some of the bugle calls he was familiar with on the accordian, and I remember the Charlie Reveille and Meal Time calls in particular. As a boy I was also delighted to discover bugle calls quoted in the Book "Time Enough for Love" and wrote these out on notation paper to play on the piano. My thanks to Jeffrey Dane for his input to this article.